This chemistry dictionary offers the chemistry definitions starting with the letter F. These glossary terms are commonly used in chemistry and chemical engineering. Click the letter below to find the terms and definitions beginning with that letter. f subshell – A subshell that corresponds to the angular momentum quantum number ℓ = 3, found in the fourth and higher principal energy levels. Each contains seven orbitals. f orbital – An f orbital corresponds to an electron orbital with angular momentum quantum number ℓ = 3.
face-centered cubic – A crystal unit cell that is cubic in shape with identical atoms at each corner and in the center of each face. Example: Calcium and strontium form this type of unit cell, as do many of the transition elements. facilitated diffusion – Facilitated diffusion is the spontaneous transport of molecules or ions across a membrane with the aid of transmembrane integral proteins. Fahrenheit – The Fahrenheit temperature scale was developed by Daniel Fahrenheit (1686-1736) and denoted by the symbol °F. This temperature scale is still in use in a few countries, including the United States for mostly non-scientific uses. It was originally based on three calibration points. The first point was to allow a mixture of ice, water, and ammonium chloride to reach equilibrium and recorded the lowest temperature as 0 °F. The second point was recorded at 32 °F when ice would start to form on the surface of still water. The third point was assigned to 96 °F and taken from the body temperature of a person. This point was later changed the top number at 212 °F for the boiling point of water. Fahrenheit temperature scale – The Fahrenheit temperature scale is a common non-SI temperature scale used in the United States and Belize defined by assigning the temperatures 32 °F for the freezing point of water and 212 °F for the boiling point of water. The degree Fahrenheit (°F) is defined by 1/180 the range between these points. family – In Chemistry, family refers to a group of elements with similar chemical properties. Chemical families tend to be associated with the vertical columns of the periodic table. Example: Group 18 on the periodic table is also known as the noble gas family. Faraday (F) – A unit of charge denoted by F equal to the total charge on 1 mole of electrons. 1 F = 96,487 coulombs. Common Mistake: confusing a Faraday with a farad, also denoted by F, which is a unit of capacitance. Faraday constant – The Faraday constant, F, is a physical constant equal to the total electric charge carried by one mole of electrons. fat – A fat is a compound that is generally soluble in organic solvents and largely insoluble in water. Fats are triesters of glycerol and fatty acids. Fats may be either solid or liquid, though sometimes the term is reserved for solid compounds. fatty acid – A fatty acid is a carboxylic acid with a long side chain of hydrocarbons. Most fatty acids contain an even number of carbon atoms in the hydrocarbon chain and follow the general molecular formula of CH3(CH2)xCOOH where x is the number of carbon atoms in the hydrocarbon chain. feedstock – Feedstock refers to any unprocessed material used to supply a manufacturing process. Example: Crude oil is a feedstock for the production of gasoline. femto – Femto is the prefix associated with x10-15 and is denoted by the symbol f.
Example: The size of a hydrogen atom’s nucleus is approximately 1 fm or 1 x 10-15 m.
ferrate – Ferrate is a polyatomic ion with formula FeO42-. fermium – Fermium is the name for the actinide element with atomic number 100 and is represented by the symbol Fm. fermentation – Fermentation is a class of chemical processes that produce energy through oxidation reactions with organic compounds. ferric – Ferric is a deprecated chemistry term for the iron ion with a +3 oxidation state or Fe3+. ferrous – Ferrous is a deprecated chemistry term for the iron ion with a +2 oxidation state or Fe2+. ferrum – Ferrum is the Latin name for the element iron. Ferrum is the source for iron’s symbol Fe. filtration – Filtration is a mechanical or physical process to separate solid particulates from fluids. first law of thermodynamics – First law of thermodynamics states that the total energy of a system and its surroundings remain constant. Alternate Definition: The change in the energy of a system equals the heat flow in the system from the surroundings minus the work was done by the system on the surroundings. Also known as the Law of Conservation of Energy. fire – Fire is the heat and light formed as a product of an oxygen based combustion. fire point – Fire point is the lowest temperature where the vapor of a liquid will initiate and sustain a combustion reaction. fire retardant – A fire retardant is a compound used as an additive to reduce the flammability of a material. Example: Aluminum hydroxide is a fire retardant used in material coatings. fission – Fission is the splitting of an atomic nucleus into two or more lighter nuclei accompanied by energy release. The original heavy atom is termed the parent nucleus and the lighter nuclei are daughter nuclei. flame test – A flame test is an analytical technique to identify the presence of metal ions in a sample by heating the sample with a flame and examining the color of the flame. flammable – Flammable is a property of a material relating how easily the material ignites or sustains a combustion reaction. flash point – Flash point is defined as the lowest temperature the vapor of a liquid initiates a combustion reaction. fluid – A fluid is any substance that flows or deforms under an applied shear stress. Fluids comprise a subset of the states of matter and include liquids, gases, and plasma. fluorescence – Fluorescence is luminescence that occurs where the energy is supplied by electromagnetic radiation, usually ultraviolet light. The energy source kicks an electron of an atom from a lower energy state into an “excited” higher energy state; then the electron releases the energy in the form of light (luminescence) when it falls back to a lower energy state. Examples: Fluorescent lights, the red glow of rubies in sunlight are both a result of fluorescence. fluoridated hydrocarbon – A fluoridated hydrocarbon is a hydrocarbon compound that contains one or more fluorine atoms. Example: Fluoroethylene or vinyl fluoride is a fluoridated hydrocarbon. 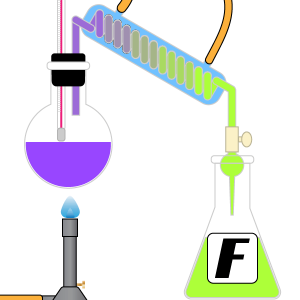 fluorination – Fluorination is a chemical reaction where a fluorine atom is integrated into a molecule. fluorine – Fluorine is the name for the halogen element with atomic number 9 and is represented by the symbol Fl. fluorocarbon – A fluorocarbon is an organic compound that contains one or more fluorine atoms. Example: Fluoroethylene or vinyl fluoride is a fluorocarbon. foam – Foam is a substance where air or gas bubbles are trapped inside a solid or liquid. Examples: Styrofoam, whipped cream, soap bubbles are all foams. force – Force is a push or a pull on an object with mass that can cause it to change its velocity (to accelerate). A force is a vector, which means it has both magnitude and direction. The SI unit of force is the Newton (N). formalin – Formalin is an aqueous solution of formaldehyde. formation reaction – A formation reaction is a reaction where the one mole of product is formed. formula mass or formula weight – The formula mass of a molecule is the sum of the atomic weights of the atoms in the empirical formula of the compound. Example: The molecular formula for glucose is C6H12O6, so the empirical formula is CH2O. The formula mass of glucose is (12)+2(1)+16 = 30 amu. fractional distillation – Fractional distillation is a process by which components in a chemical mixture are separated according to their different boiling points. Vapors from a boiling solution are passed through a column. The temperature of the column gradually decreases along its length. Components with a higher boiling point condense on the column and return to the solution; components with lower boiling points pass through the column and are collected. Example: Gasoline is produced from crude oil using fractional distillation. francium – Francium is the name for the alkali metal element with atomic number 87 and is represented by the symbol Fr. free electron – A free electron is defined as an electron not bound to an atomic nucleus. free energy – Free energy refers to the amount of internal energy of a thermodynamic system that is available to perform work. free radical – A free radical is a molecule with an unpaired electron. Because they have a free electron, such molecules are highly reactive. Examples: Singlet oxygen and free hydroxy groups are both free radicals. freezing – Freezing is the process through which a substance changes from a liquid to a solid. All liquids except helium undergo freezing when the temperature becomes sufficiently cold. Example: Water changing to ice is a freezing process. freezing point – Freezing point is the temperature at which liquid changes to a solid. The freezing point of a substance is not necessarily the same as its melting point. freezing point depression – Freezing point depression refers to the phenomenon that occurs when the freezing point of a liquid (a solvent) is lowered by adding another compound to it, such that the solution has a lower freezing point than the pure solvent. Example: The freezing point of seawater or even ordinary salt water is lower than the freezing point of pure water. frequency – Frequency is the number of times a point on a wave passes a fixed reference point in one second. The SI unit for frequency is the Hertz (Hz). friable – Friable is a property where a material is easily crumbled or broken down into smaller pieces. Examples: Styrofoam and sandstone are friable materials. fuel cell – A fuel cell is a device that converts the chemical energy of a source fuel into electrical energy. fullerene – Fullerenes are carbon molecules arranged to form spheres, tubes or ellipsoids. Example: Spherical fullerenes, C60, is known as buckyballs or buckminsterfullerenes. full range naphtha – Full range naphtha is a type of naphtha distilled from 5- to 12-carbon hydrocarbons boiled between 30 °C and 200 °C. functional groups or functional moiety – A functional group is a specific group of atoms within a molecule that is responsible for characteristic chemical reactions of that molecule. Examples: Alcohol -OH and aldehyde -COH are both functional groups. fungicide – A fungicide is a compound which kills fungi. Fungicides are antifungal compounds. furanose – A furanose is a five member ring structure containing four carbon atoms and one oxygen atom. Furanose is a simple sugar molecule. fusion – Fusion is the process of combining lighter atomic nuclei to form a heavier nucleus with a release of energy.